South African game developer Thoopid, of Snailboy fame, has released a new game called Tap the Coin. It is available for iOS (iPhone and iPad) and is free to download. An Android version has also just been launched. 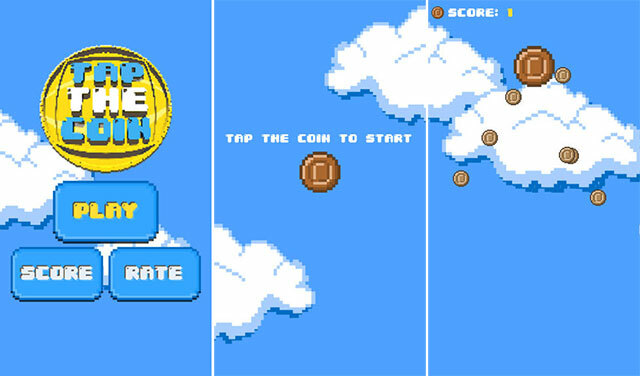 Tap the Coin requires the player to tap coins while bouncing forward to progress. It gets challenging when coins, which are unlocked as one plays, come in from different angles. Players start with bronze coins, then silver, followed by gold, diamond, platinum and “rainbow”. The game bears a strong resemblance to the rudimentary but hugely popular game Flappy Bird, which was pulled from app stores by its developer, Dong Nguyen, last month. Nguyen said he didn’t want the fame that came with the game’s success. Both Flappy Bird and Tap the Coin have a similar pixellated design and game play is identical. Lead developer and MD of Thoopid RW Leibenberg says inspiration was taken from Flappy Bird for its simplicity, but not necessarily for character or difficulty. The game was conceptualised, developed and published in two weeks, with one week for Apple App Store approval. Liebenberg says the Android version will be submitted to the Google Play Store shortly. The company will monetise the game through ads — iAds on iOS and, once approved on the Play Store, through AdMob.